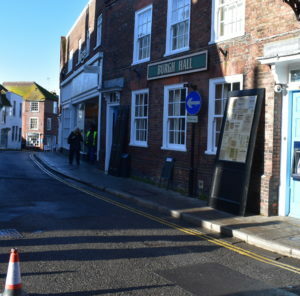 On Tuesday of this week one might well have thought that real royalty was visiting Rye judging by the crowds standing at the entrances to Market Road and Lion Street and peering out of doorways to shops. 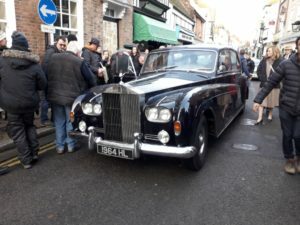 Not real royalty but close to theatrical royalty as actress Helena Bonham Carter swept down the High Street in her ‘royal’ Rolls and into the library – except, of course, it wasn’t a library any more. 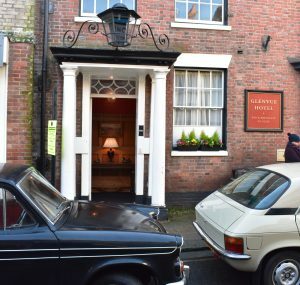 The NatWest building becomes a hotel…..
We had been transported back, by the magic of cinema and set designers, to the Scottish town of Peebles 40 or so years ago. 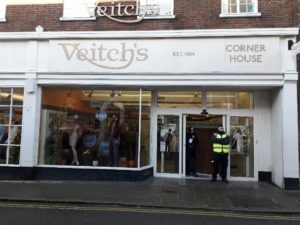 1970’s style signs were over the shops, window dressing reflected the age and sundry ‘extras’ looking, by today’s standards, remarkably smart, with hats, suits, ties, umbrellas and briefcases and the ladies with Mrs Thatcher-style hand bags and not a pair of jeans in sight – those were the days when we knew how to dress! 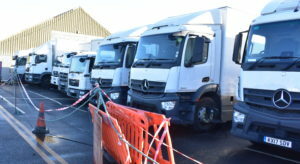 And, of course, there were all the usual accoutrements of the film makers – lorries by the dozen, hundreds of thousands of pounds worth of camera equipment, sound recorders, miles of cabling, gantries and more, together with seemingly hundreds of technicians from camera crew, boom operators, 1st, 2nd and 3rd directors, make-up, continuity and other sundry crew, including a number of young ladies in tight jeans rushing up and down with their walkie-talkies (as we called them in the ’70s) glued to their ears. 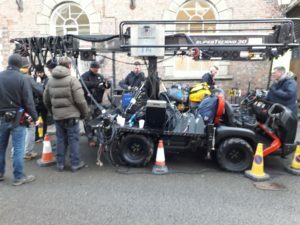 Their purpose was never obvious but, as those of us with some small experience of film-making know, no film set is complete without them. 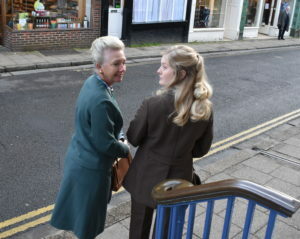 After hanging around for some time (film making is more about waiting than filming), security ushered everyone except the period-dressed extras off the street and out of camera shot. 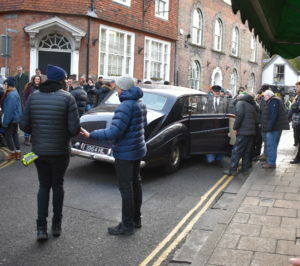 A cry of ‘Rolling’ signified the cameras starting up and was the cue for the extras to start their moment of fame and on the call of ‘Action’ the black Rolls Royce accelerated towards the library, passing by the concealed onlookers so quickly that barely a glimpse of the occupant could be seen. Just like real life, then. After half-a-dozen takes it was all over. The stars went off to a well-earned G and T, the technicians began to pack up their kit and by the following day shop signs were down, and the windows had gone back to their familiar look, the bank, that was a hotel was now a bank again and one could be forgiven for thinking that the mythical Scottish town of Brigadoon had re-appeared and then gone again, in Sussex. Yes, some people complained at the inconvenience and, yes, traffic was held up or re-routed and we all had to be put up up with being hustled off the street at regular intervals, but who cares? 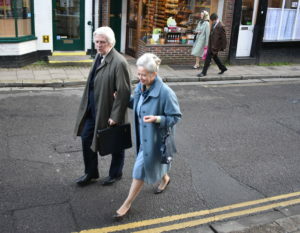 These occasional visitations by a world most of us know little about, bring a breath of the 21st century to our ancient town and, for those who were watching, a few hours of entirely innocent fun and enjoyment. Image Credits: John Minter, Heidi Foster. Of course ‘Betty’s’ was the Home and Colonial, a grocery store, back in the day. And I certainly wore jeans in the 70s.